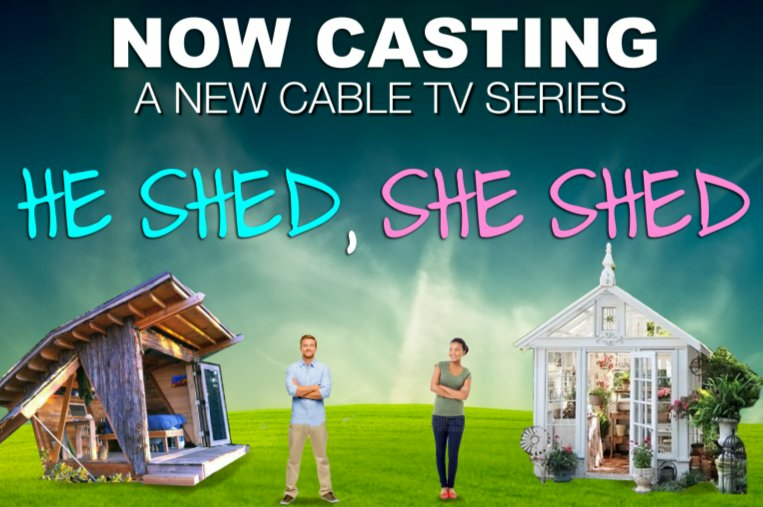 From the producers of FYI’s hit series Tiny House Nation comes a new show about amazing backyard sheds… He Shed, She Shed! Are you planning to build the coolest, most amazing one-of-a-kind shed and want to show it off to all your neighbors? Have big plans to take your shed to the next level? Ready to show America how to pack giant ideas into tiny spaces? If you’ve got plans to create a backyard structure to use as a guest house, business headquarters, entertainment area/bar, a backyard retreat — or anything else you can dream up, we want to hear from you! From a backyard cabin, to a tricked-out pool house, a mother-in-law suite to a garden cottage, container house to futuristic pod… if you can dream it, we want to see it! Our team wants to take a peek at the whole building process from the groundbreaking to the finishing touches, and show America that it doesn’t take a huge space to make a huge impact. If this sounds up your alley, please, email your name, contact information, and a brief description of your shed project and budget to kate.corcoran@loudtelevision.com.